You see them every week in their logo-covered, fire-retardant jump suits, doing back flips after winning a race. You see them on ESPN, you see their cars speeding past in a blur, lap after lap, and you read about them in newspapers, magazines, and on the internet. You hear them interviewed and watch them on commercials for everything from pizza to cell phones. Now, for the first time, you can see them as they actually live. 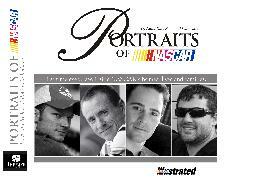 Portraits of NASCAR brings you into their dens, kitchens and living rooms, providing a relaxed and intimate at-home look at the private lives of your favorite NASCAR drivers. They're all here, from Dale Jr. to Bobby LaBonte, Kyle Busch, Jimmie Johnson, Kevin Harvick, Mark Martin, and many more. 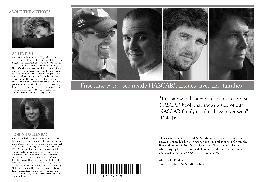 In stunning black and white photography and accompanying text, you'll see them relaxing with their wives and children, you'll learn about their hobbies and outside interests and what they enjoy once outside the frenetic pace of their demanding racing careers. You'll get a first-hand look at the beauty and closeness of the entire motorsports family and how those ties bring strength and support to these incredible men and women. Portraits of NASCAR offers a rare glimpse into the private lives of these drivers that you won't want to miss. You'll never look at NASCAR in the same way again.